when sister and i started planning our jasper adventure, i knew i wanted to go see spirit island. seeing it all over instagram solidified it as a true representation of what the national park is all about: quiet beauty. nope. i definitely did not. thankfully for everyone involved, sister is much smarter than me and she also loves to do her research. 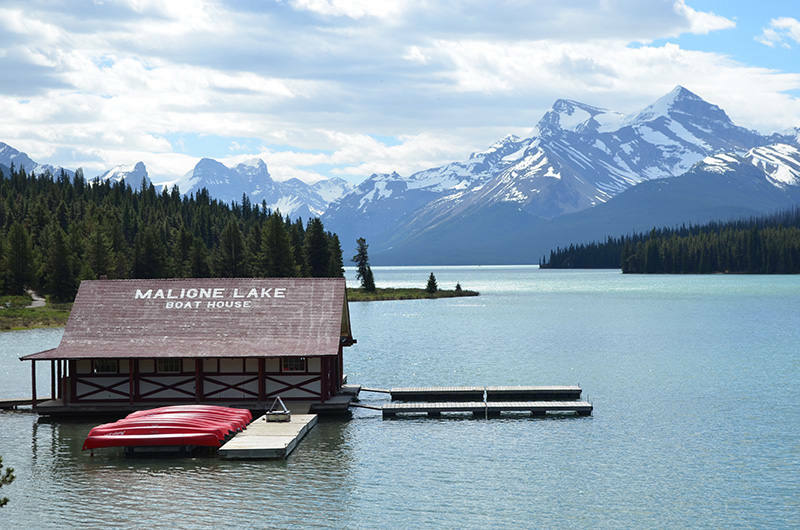 maligne lake is a 48km drive from jasper’s centre via maligne lake road. take your time on this drive because of all the twists and turns, and because you’re likely to see some wildlife on the way. when you arrive, you’re first greeted by the cutest little boat house with a row of red canoes. make sure your camera battery is fully charged, as you’re going to start snapping photos – but it needs to last for at least two hours! walk a bit further down the shoreline, and you’ll get to the docks where the maligne lake boat cruise depart. after discovering i had to take a boat down the lake to see spirit island, sister and i were lucky enough to be invited by Pursuit to experience the lake cruise. 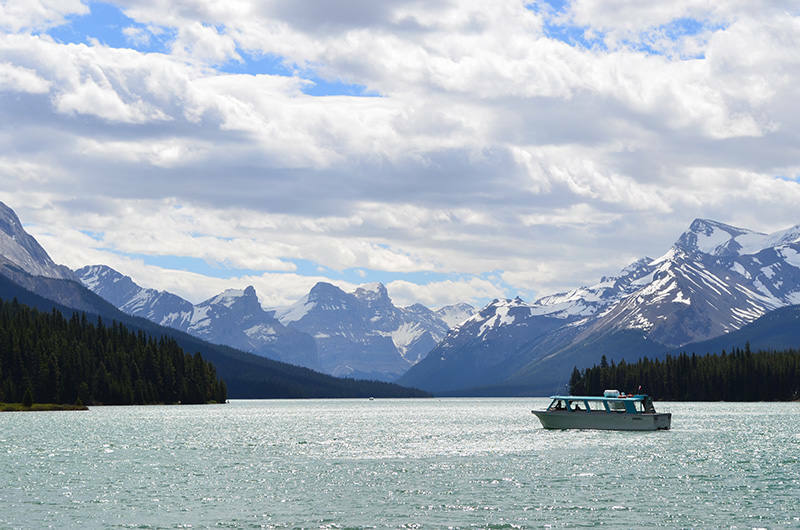 guests to the cruise can explore the lake from the comfort of glass-enclosed and heated cruise boats while a knowledgeable guide retells maligne’s history and explains its geology, wildlife, weather, flora and fauna. the interested tourist will love all the visual aids passed around, including rock samples, books, and photos. if you’re just interested in the scenery, stare out the large windows or head out to the back deck of the boat to take in the views. 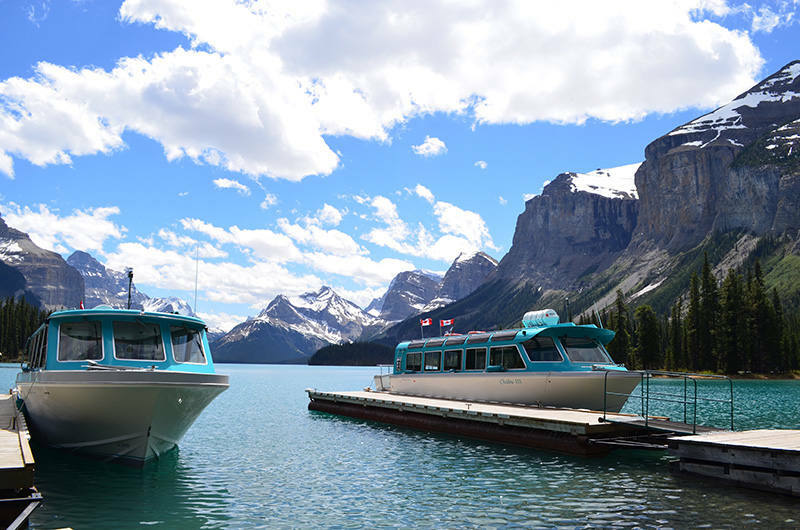 as you travel down the lake, you may notice the colour of the water is different at spirit island than where cruises depart at the maligne lake docks. the further south on the lake you travel, the closer you get to glaciers, and the more emerald-coloured the water becomes due to the presence of rock flour from the glaciers. the boat will dock and give you some time to jump off and explore this new end of the lake and spirit island. thankfully parks canada has put some rules in place to preserve the area in its natural state, so walking onto the island is not permitted. instead, take the well-groomed short path from the docks to viewpoints overlooking spirit island. besides being breathtaking, spirit island is rich in history. it was named by the Stoney Nation indigenous people for the experiences their ancestors had at this place centuries ago. they believe mountains are physical representations of their ancestors. the fact that spirit island is surrounded on three sides by the same mountain range is very rare and makes it particularly significant to the Stoney. spirit island – which really isn’t an “island” – is a tiny grove of trees and pristine nature separated from the mainland by an isthmus (aka a narrow piece of land connecting two larger areas across an expanse of water by which they are otherwise separated). 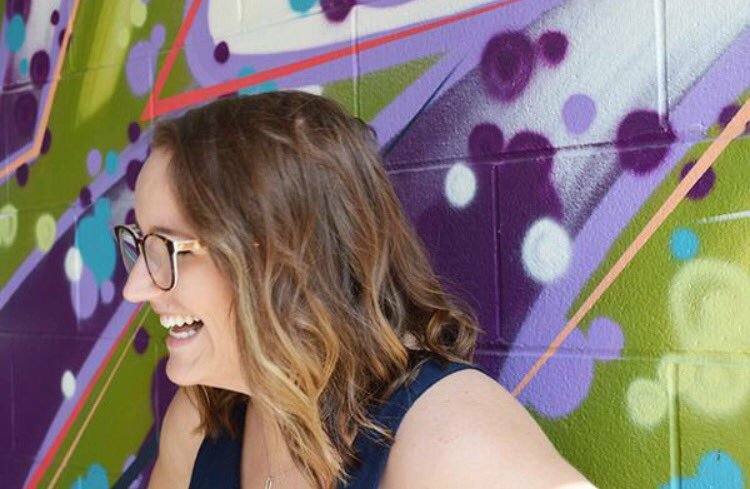 make sure to bring your sister along to snap beautiful photos of you. no sister? there is an island guide ready and available to answer any questions you may have and snap a few shots for you. our island guide’s name was Sam, a friendly Australian fellow eager to answer our burning questions. since he knows the island and lake so intimately, i asked Sam what his favourite fact or tidbit was. he told us that Mary Schaffer (the first european to see maligne lake in 1908) looked out at the mountain range surrounding the island and called it the Hall of the Gods. “can’t you just picture Zeus sitting up there ready to talk?” Sam asked us while pointing out to the left side of the lake. yes, Sam. yes i can. Sam was right, the true attraction of spirit island is the backdrop: a ring of impressive peaks and glaciers circling the south end of the lake. once you’re back on shore, you can extend the day by taking on one of the many hiking trails that start from the lake. or you can do what sister and i did, and pack a picnic to enjoy. leftovers, fresh fruit and canned sparkling wine made for a great afternoon as we sat in the sun and watched the boats come and go. 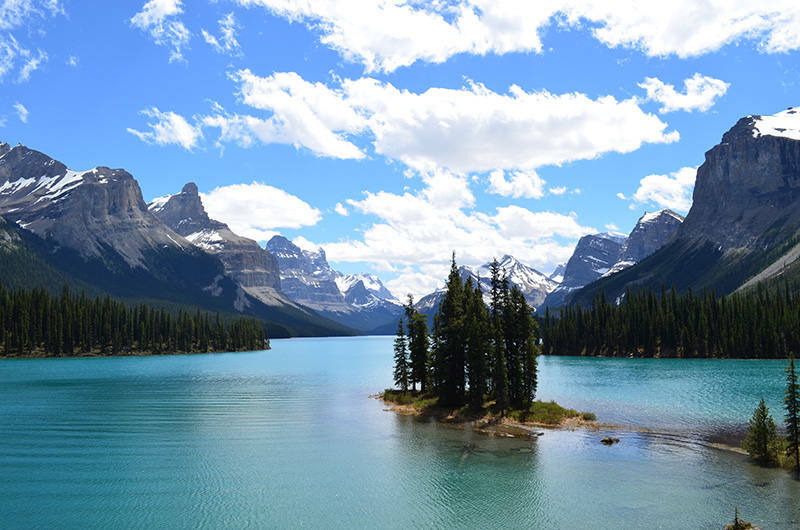 maligne lake, spirit island, and the boat cruise are even more stunning in person. add it to your travel bucket list, because it’s definitely a must-see! 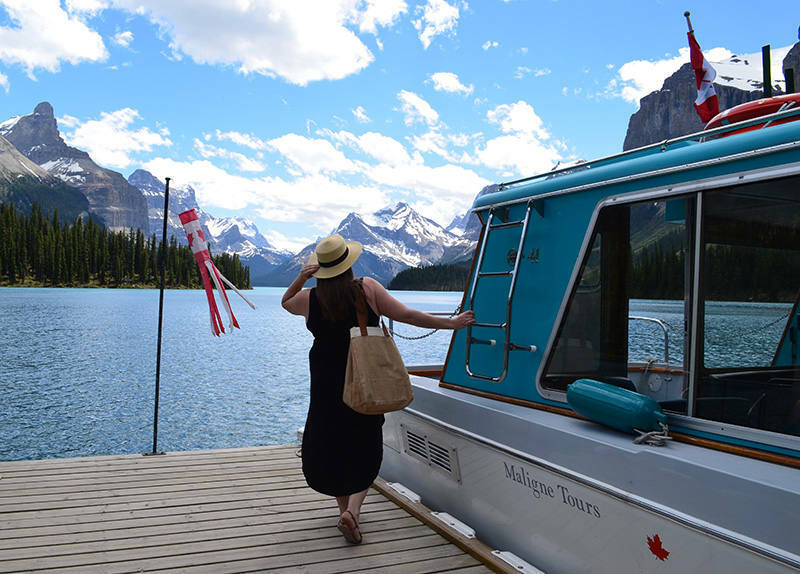 have you been on the maligne lake boat cruise? thank you Pursuit for taking us out for a day on the lake and letting us experience such beauty. Previous Post oh hello, june. Next Post father’s day at willow park village.